Animation Show of Shows Cincinnati! Free Screening! 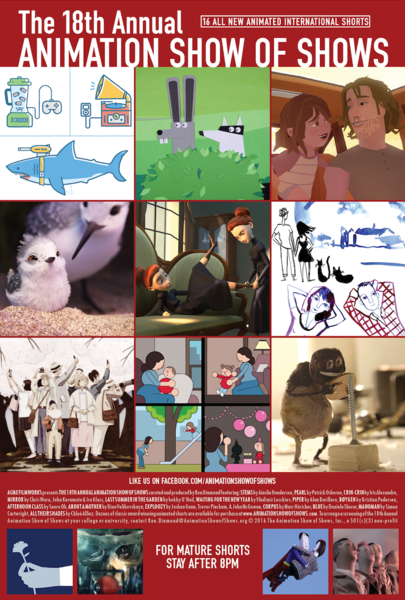 Animation Show of Shows at Mini Microcinema! Guys we really lucked out- thanks to the Mini Microcinema the 18th Annual Animation Show of Shows will be playing in Cincinnati this Saturday. After the screening we will probably go out for lunch in the neighborhood, please join us! The ANIMATION SHOW OF SHOWS returns for its second year in theaters with 13 charming family-friendly films. Highlights include Disney/Pixar’s ACADEMY AWARD® WINNING “Piper,” the latest in 360º storytelling in Google’s touching father-and daughter-journey the Oscar® nominated “PEARL” by Academy Award® winner Patrick Osborne and “About a Mother,” a new folktale with echoes of Shel Silverstein’s “The Giving Tree,” The show also features a late-night bonus of four provocative shorts exclusively for mature audiences.